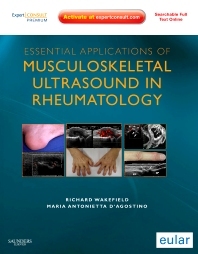 Essential Applications of Musculoskeletal Ultrasound in Rheumatology, by Richard Wakefield & Maria Antonietta D’Agostino, assists you in most effectively using musculoskeletal ultrasound to diagnose and monitor the progression of rheumatoid arthritis, vasculitis, and other rheumatic and soft tissue disorders. Sponsored by the European League against Rheumatism (EULAR), it is the first reference that attempts to set rigorous guidelines for how and when to use musculoskeletal ultrasound in the evaluation of these cases. At expertconsult.com you can reference the complete contents online, along with an image gallery, supplemental video stills and clips, and clinical cases with companion assessment questions. Detect rheumatic diseases much earlier using musculoskeletal ultrasound, and monitor their progression more accurately, with reliable, expert guidance from internationally renowned authorities. Visualize the imaging presentation of a full range of rheumatic diseases with a wealth of full-color illustrations. Apply rigorous, consistent guidelines on how and when to use musculoskeletal ultrasound. Access the complete contents online at expertconsult.com, along with an image gallery, supplemental video stills and clips, and clinical cases with companion assessment questions. 2 "Pitfalls of Doppler Ultrasound"